You're not going to miss me in this one. 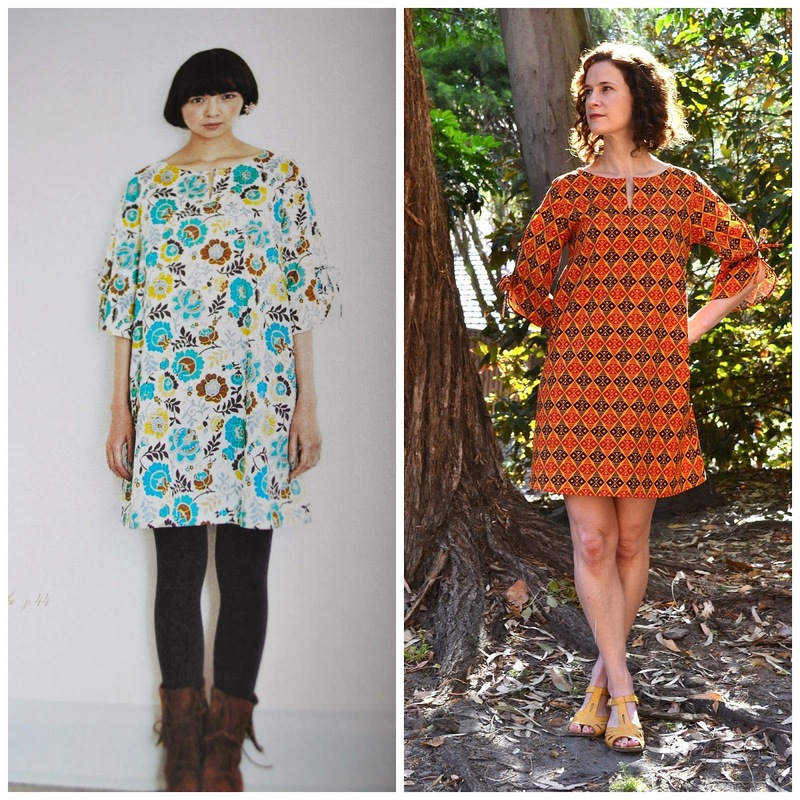 The name of this dress came about from an Instagram exchange with Gabrielle of Up Sew Late. In the process of sewing up this number I joked that I figured I'd stop traffic. Not because it's risque in anyway, but because I'm fairly certain you could use my fabric in place of hi-vis vests for traffic control officials. Ain't ever gonna miss this one. But I love it! I spotted this National Flags collection cotton poplin in my usual hunting ground (Spotlight) and knew it was the fabric for this dress right away. I love poplin. So crisp, so well-behaved. This is Pattern F Tunic dress with slit sleeves in Liberty print from Yoshiko Tsukiori's Stylish Dress Book: Wear with freedom. I love the sleeve detail, which was also probably my impetus for making this dress. I like simple shapes, but with an interesting detail or two and this fits the bill. I found the sizing initially tripped me up with this one. I measured an 8 at the bust and at least a 12 at the hip. In fear that the dress would be too snug, I graded up to the 12 in this area. Boy was I wrong. It looked like the worst kind of mu mu. I took it back to a size 8 all over and then took a further 8cm (!!!!!) out of the hem circumference. Yikes! It doesn't appear to be that A-lined when looking at the pattern picture or the pattern itself, but good lord it looked ridiculous on me. I am super-super happy with the result and can't wait to wear it. I might add I am not normally one to draw attention to myself so I am a little nervous. Ahhhh bugger it, I am crafter, hear me roar! It looks SO great! So simple and feminine and wearable. Such a great piece. It is lovely - a perfect shape on you and the colours are wonderful! Great pattern matching on the sleeves too. Your is so much better, its lovely. You've got the fit just right and I love the sleeves. Wear with pride. Love it to pieces. 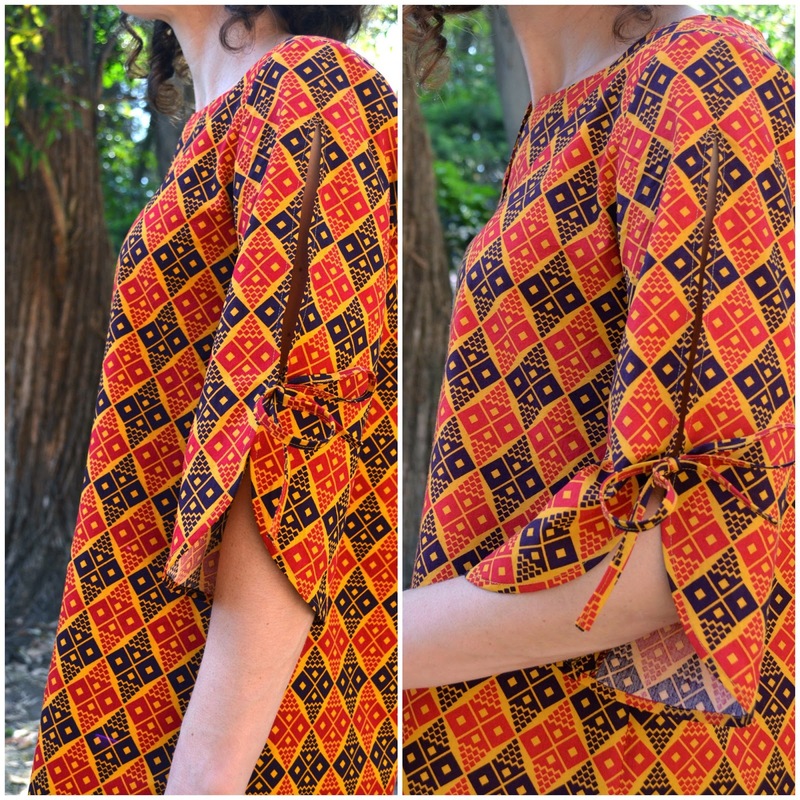 Such a chic look and I'm very impressed with the sleeves - how awesome is your pattern matching?! Lovely summery piece. I agree with Gabrielle, it really is a mix of 70s and Japanese. It is wonderful! And love your stop traffic pose! Oh I love those sleeves! It definitely has a 70s vibe which I am totally digging. Roar & roar some more. It's an ace dress Jillian. Wear it often. I have a Japanese dress to share this week too! love its clean line and the interesting sleeve detail is just the cherry on top. In my opinion the fabric (that I like very much) plays a big part in maintaining the 70's visuals. The point is: you look great in it!!! Looks great! I think you got the sizing spot on. I like your version waaaaaay better than the original pic. You should be in the book ! I love it, the sleeves' detail is awesome and that's just my kind of fabric, vintage and bold :) When sewing with Japanese patterns, if the design is loose or has any gathers my advice is to keep your bust/armhole size and take the smallest size for all the rest, not to mention that you can definitely remove a good 8-10 cm in width! The sleeve detail is really pretty! Fabulous dress, I adore this pattern those sleeves are awesome. loving those sleeves!! what a great dress. Great dress...and I actually don't think it's too bright at all. Those sleeve details are killing me - love it! You look fab and stylish as always. "wear with freedom" indeed! Now that I've seen your Frocktails version, the sleeves are fab. Great choice Jillian.